What a pleasant surprise. 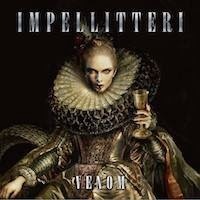 Venom, the latest effort by the virtuoso guitarist Chris IMPELLITTERI and band (Rob Rock - Lead Vocals. James Pulli - Bass. Jon Detti - Drums) goes through several different layers of US. Metal and speedy Neo-classical stuff. In fact. You don't come across many of these pure guitar shredding styled albums anymore. There's Yngwie of course, but he's been kind of off beat lately and there's not much else on the horizon. At least not with this kind of high quality and swagger. The easiest way to just try and start to explain the sound of 'Venom' and especially if you've never even heard of Impellitteri before? First of, shame on you. Secondly. Try and imagine the mix of albums such as Stryper's (The Yellow and Black Attack), Annihilator (Set The World On Fire), the healthy dose of DIO, and of course Yngwie Malmsteen (the 80's era). Plenty of licks and tricks, speedy soloing and riffing, powerful hi-pitch vocals by Rock, and melodies that works in between the styles of (melodic) Trash to old school metal and the neo-classical. But I shouldn't point out these things for you since I believe it's their ninth or tenth? full-length album. I only have about five or six of them though. The band starts off the record sounding like an angry wasp with its relentless title track and speedy metal approach. According to Chris he worked for three years to develop a new picking technique that allows him to shred and strike each note with greater clarity and attack. Something which the "Empire Of Lies" is living proof to with its hammer on technique and flashy solo. The lyric speak of the end of time with the following message and I quote, 'All hail to Caesar, the ruler of the world. So full of delusion, his arrogance unfurled. I see the writing on the wall in neon lights. Welcome to all- Empire of lies', end quote. "We Own The Night", DIO metal meets Impellitteri and "Nightmare" goes through several horror stages of Megadeth and Annihilator-like segments. It's one of those fist in the air kind of melodies in neck-breaking speed and style. Very metal, very good. "Time Machine", Impellitteri meets Iron Maiden and spend plenty of time discussing old Eddie memories and moments. It's twelve tracks of relentless Impellitteri metal and it's old skool. Wicked!